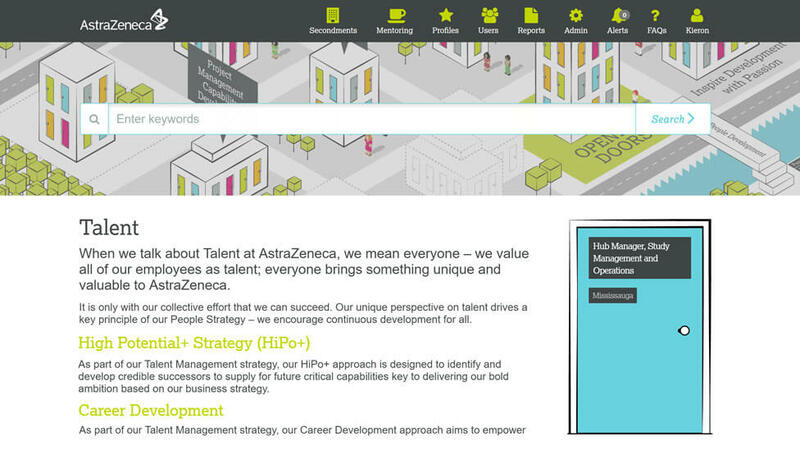 We helped AstraZeneca make internal opportunities more accessible to employees with a talent development web app for managing enterprise-wide secondments and mentoring. As part of its on-going strategic mission to strengthen company performance through the continued development of its employees, AstraZeneca needed a solution to make its range of secondment and mentoring opportunities more easily available. By creating a bespoke discovery management and reporting tool, the company could allow key members of its workforce to continue to build valuable skills, as well as realise the benefits of increased employee satisfaction and internal collaboration. 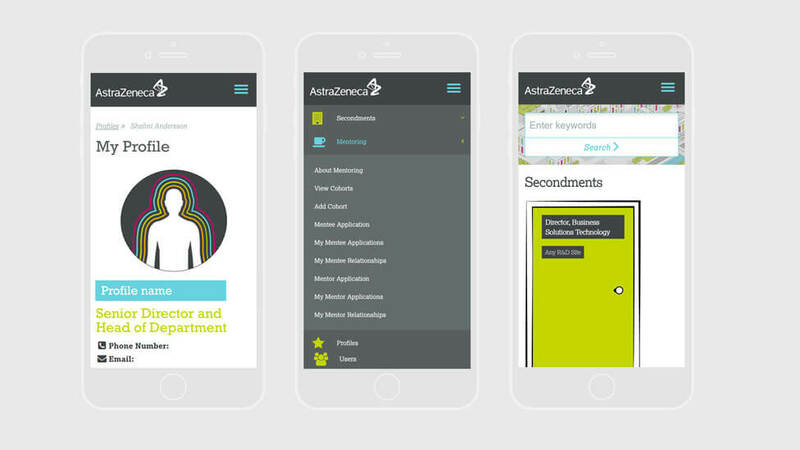 Having worked closely with AstraZeneca in the past to develop other enterprise applications, we understood their desire for a secure and versatile talent development web app that would benefit 59,000 employees worldwide. As well as allowing interested staff to see relevant secondment and mentoring opportunities, the application would also need to help the Human Resources team manage the application process efficiently and provide functionality that would continue to support employees throughout their career. We delivered a bespoke solution that makes managing career development opportunities more coordinated, transparent and accountable. 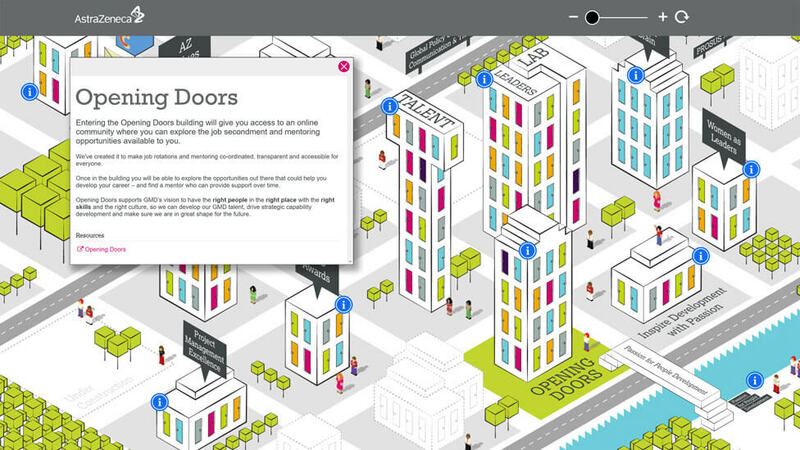 Beginning with the user interface, we designed an engaging cityscape that employees would be able to access via a single sign-on. Buildings within the cityscape were designated as clickable hotspots that would reveal a variety of company initiatives, including Opening Doors. This solution gave users the ability to build a personal profile within the system, review and apply for secondments, review the progress of their applications, apply for mentoring cohorts and receive notification of new opportunities as they became available. To further support the company’s mentoring programme, Opening Doors allowed users to apply to become mentors or mentees. The web app would then match employees to each other via a custom compatibility algorithm. 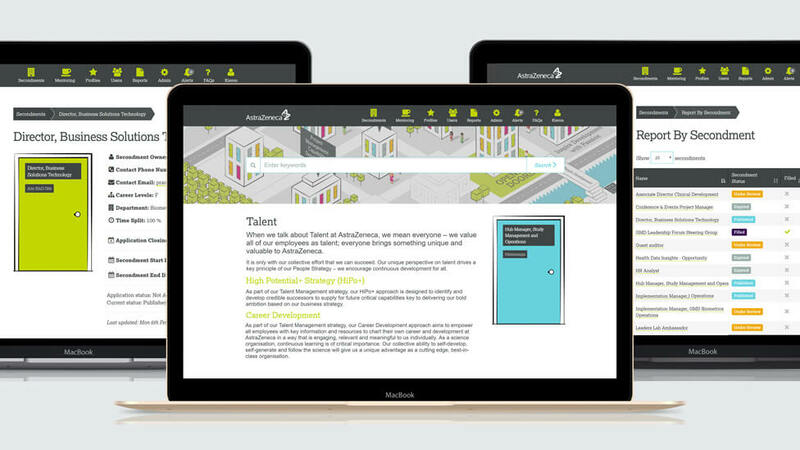 Customised specifically for AstraZeneca’s Human Resources team, the portal also provided a wide range of tools to help key staff monitor and manage participation in the company’s professional development programmes. Features we developed included in-depth reporting and analytics, as well as tools that made it easy to create and post new opportunities and facilitate the review of candidate profiles. Secondment and mentorship applications included a range of standardised fields for efficient data collection. Management of the applications was handled through the creation of a custom workflow that matched AstraZeneca’s existing internal procedures. We facilitated the candidate review and application approval process with automated notifications for line managers, and other key stakeholders, and the ability to easily evaluate and score applicants. Incorporates scope to expand the web app with additional buildings available to accommodate new features as the company’s programme develops. Clickable hotspots contain rich content, such as video and documents that prompt users with additional calls to action. The responsive web app was easily accessible from anywhere in the world, via desktop or mobile devices, while also being securely restricted to AstraZeneca employees. Users could log in to review the status of their applications, as well as receive notifications for new opportunities that fit their preferences. We integrated survey resources to allow participants and managers to provide feedback about their experience and how it contributed to employee development. Initial feedback about the bespoke solution we created for AstraZeneca, both from the client and employees who have used the portal, has been very positive. The talent development web app is currently being piloted within the business with scope to roll it out globally in the future. We are also currently working on Phase II of the project, which incorporates rewards and recognition.